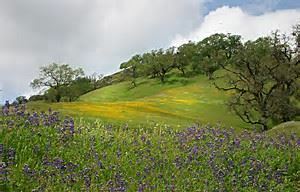 As we dry out, spring breezes bring the smell of wild flowers, fresh green grasses, mowed hay fields, tilled rich soil, and bud break and blossoms on fruit trees and vines. Spring is a good motivator! After the March General Meeting several members approached Board members to have us consider sponsoring young people in response to the passionate PACE program. Earlier in September I posed a question: "Could you recite our mission statement?" It appears on our monthly slides each meeting. Could you do it right now? Your program committee under the direction of the First Vice President does a wonderful job of bringing programs to us that cover a broad variety of thoughtful, emotional, informative, and educational topics. This year, as stated, the goal was to expose our members to programs and ideas outside of TMC which might inspire their hearts to participate with and/or support a variety of philanthropic organizations. Thus far, we have had the privilege of hearing program speakers, representatives, and founders of organizations that do INSPIRE us to take action. But understand that the membership as well as the Board of Directors are charged with our mission statement: "To enhance the educational, civic, social and cultural quality of the San Luis Obispo community." Let us not forget to step up and help to this end FIRST as a Club. Yes, there are other ways we can contribute and should do so if the desire is strong. But I challenge you to remember why you are a member. Dig into the history of our club and it's list of accomplishments. You will be recharged and inspired. Both the TMC and TMCC mission statements reflect our goals well. They are a covenant with the public’s trust, and our promise of the work we do for this community. The mission statements help us focus and be clear about our work to achieve the goals we have set. They set parameters to help us not undermine our impact. For TMC, that impact is the enrichment of the community of San Luis Obispo. It is wonderful to hear from many of you who may be inspired to reach out to our speakers on your own. We would love to hear from you, if you are willing to share your participation with us in the future. For a moment, ponder and remember why you are a member. We are stewards of this building. We are the reflections of those who made strides before us. We will make that community difference they sought to achieve. Spring into Action – Volunteer – Make TMC matter – Say Yes to TMC. I'm sitting over a cup of tea, having just come back from dropping my granddaughter back home. She had spent the night and we had time together making applesauce. This is TMC. Like my favorite cup, it's on the shelf for a while, then we take it down, admire it and fill it to the brim with love, caring, leadership and kindness while sharing creative thoughts and goals. When we fill the cup as we plan, share, or start a project there are times when we don't see eye to eye and things can heat up. But what warmth we feel when we put ourselves aside and let the steam carry us past our concerns and guide us back to our concerns for others. We must remember to pour slowly, and listen so it will not crack. When we do it right we seem to have just the right blend. 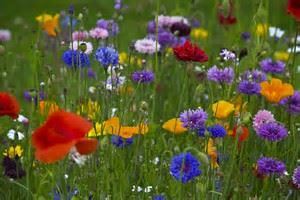 Let our friendships and thoughts of our beautiful community and our remarkable building sweeten the cup as we stir them in. ...It's cooled off now and I will drink and enjoy one sip at a time. Down come the Valentine boxes. I was getting them down for my granddaughter so she could dive into the supplies and create those spectacular Valentines for her friends and family – little did I know I was really opening the box for me. I balanced them on the floor near the closet, as I jumped off the step stool. I fully intended to let them sit unopened for a while, since I had more important daily chores to attend to. As I straddled the boxes, and closed the closet door, my heel caught the lid of one, and the top slid off. The phone was ringing it its usual tone of urgency, the family parrot was squawking needing attention, it was starting to rain once again, and I still wasn't dressed for the appointment I had schedule so early. I let the phone go and bent down instead to tug at a ribbon that had been caught for sometime in the lid of the box. 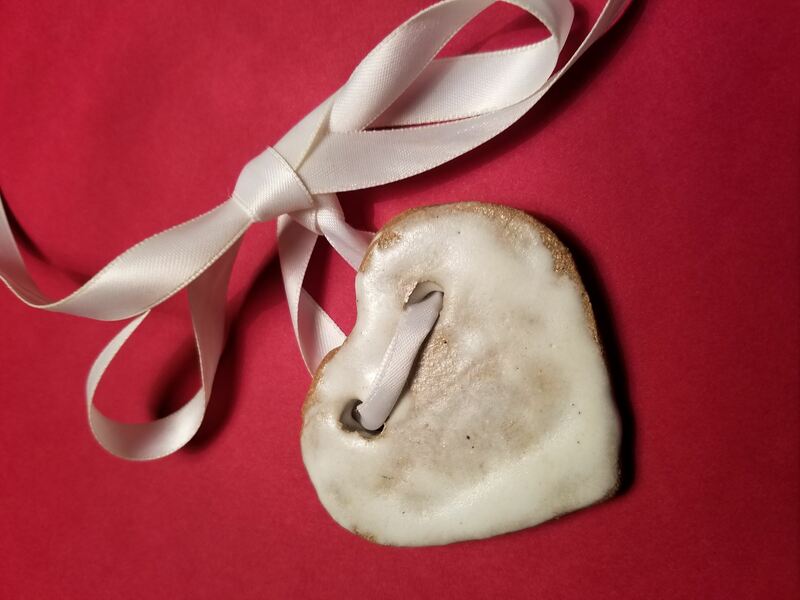 At the end of the simple satin white ribbon was a ceramic heart. It looked very much like a glazed gingerbread cookie with white frosting. On the back were the initials "AAR" carved into the back. I had added the year with a permanent marker - 1986. Again the phone….I let it go and began to read the handmade Valentines that had been mixed lovingly together in layers and stored over the years. My lashes were soon moist as I would open each one and let the words and drawings tug at my heartstrings. We have to make room for memories, learn to discipline ourselves to put aside the urgent in favor of the truly important. We used to ties strings around our fingers to remember things, why not make bows from the memories that tug at our heartstrings. Each time you read, see, or hear something that tugs at your heartstrings grab onto the ends, tie them in a bow and wrap a special memory for your heart. It would be your own Valentine, a love letter to open again and again. To get you started close your eyes and remember how you feel every time we come together as a club to support the young preschoolers through Raising a Reader. Picture the women who are uplifted after finding a safe place with support at the Women's Shelter Program. Reflect on the docent tour you had a chance to give to a couple who returned 17 years after their marriage here to share the clubhouse and beautiful grounds with their children. Remember when you were moved to be able to hear the talent of the young musicians or talk to one of the young artists who's smiles shone on our stage as we were able in some small way to encourage and support their futures with our Fine Arts Awards. As I went out the door for the appointment I tied the satin ribbon and ceramic heart around my neck. I smiled as I secured the bow and added it to my special heartstring memories of a special gift hand made by my daughter, the loving mother of my granddaughter. Were you captivated, inspired, encircled by the spirit of the holidays? How our Monday Clubhouse beamed with the holiday spirit last meeting! Thank you to all of you who spend hours lovingly preparing for the elegant Holiday Boutique. It was a beautiful reflection to the public of who we are. The youth choirs lifted us as their carols filled our rafters, voices of the young people who will guide our future. Your generous hearts filled Santa's bag with hope for the Women's Shelter. Ahead I see many moments of friendship, ongoing sharing as working hands come together on our committees, pausing a moment with friends and family over a cup of tea, greeting new members over a glass of wine, and supporting our community youth as they advance their skills in the arts. And may your holidays burn brightly, and the traditions you keep be close to your heart and fill you and yours with special memories….. Happy Holidays - see you all as we begin our New Year! The beginning of November brings the Holidays ever so much closer. We've just finished greeting goblins at our doors, when we begin to hear Christmas Carols in our markets and stores. Thanksgiving often marks the start of the holiday countdown, but for me it is a holiday filled with warm memories. Although our family table is not blessed with an abundance of Aunts, Uncles, Grandparents and Cousins, we still have a wonderful time gathering around to share a special meal. When I share family history or a family story with my children, I am often fortunate to be able to share an object, picture or scrapbook page with them as my family was one of savers. One summer as I was helping my Mother's sister close up her home for a move to Cape Cod, she handed me two more very large scrapbooks. Covered with dust and stored in an old plastic blanket bag, I decided to set them aside and continue with more urgent details. Later that September I caught a moment to return to the books and discovered wonderful treasures inside. They were from the 30's. There were paper art projects and drawings carefully crafted by children ages three and up. They were done by my Mother and her siblings and had been lovingly preserved in this set of scrapbooks by my Grandmother. One of them caught my eye. Faded from age was a paper chain. The links were stained with rust where they had been stapled and the tape had dried and yellowed, but inside a link was a message from the heart: "To mommy, this circle is my hands around you with a hug. love lizabeth". As I prepared for Thanksgiving that year, the children were impatient and wanted to know how long until Christmas. We had bought them each an Advent Calendar with hidden treasure behind each door, but it would be about a week until the first of December when they could open the first doors. I told them again how long it would be and returned to setting the table for Thanksgiving dinner. I was searching for my special napkin rings and my thoughts drifted back to the paper chain in those scrapbooks. I quickly got out my collection of construction paper and began to cut strips from the colored paper. Then I carefully wrote a message on four of the strips…..a message from my heart to my loved ones. I let them know why I was thankful they were a part of my life. I stapled each and took them back to the table and used them as napkin rings. 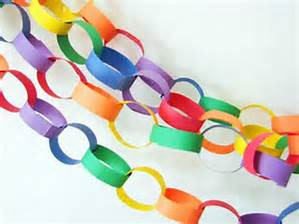 When we sat down to enjoy our meal we began by reading the paper chains links. After the meal. I gave each of them an envelope with 30 more strips in it, one for each day until Christmas. They were to write on one strip each day…...something they were thankful for, something positive that happened that day, about a special friend, a happy thought, or something special about someone in our family. Each day we would staple them together, and by Christmas we had a beautiful paper chain to decorate our tree with. Christmas morning we sat together and enjoyed reading all the special messages on our paper chain. Most important we shared a wonderful memory with each other which continues, like a chain to link us together. This November our General Meeting falls the day before our National Election and only several days before Veteran's Day. In this Patriotic year we most certainly will turn those who came before us for inspiration. This month we celebrate A Patriotic Thanksgiving – A Salute and a Retirement. We will also thank those special community members who were so instrumental in helping us achieve our listing on the National Registry of Historic Places. Please come and join us as we raise our spirits, toast our history, and retire a symbol of our patriotism. May 14, 1900. He grew up in Colorado, and graduated from the Columbia School of Journalism in 1923. After serving in the Naval Reserve he worked in the publishing industry. From 1937 – 1943 he was a staff writer for the New York Times, as both a reporter and journalist. He had his own literary career and is best known for his vivid descriptions of local cultural color throughout various geographic locals. He wove rich visual images with the use of native dialects. He is frequently remembered for his novel: When Legends Die, set in the south western United States. Borland died in February 1978. 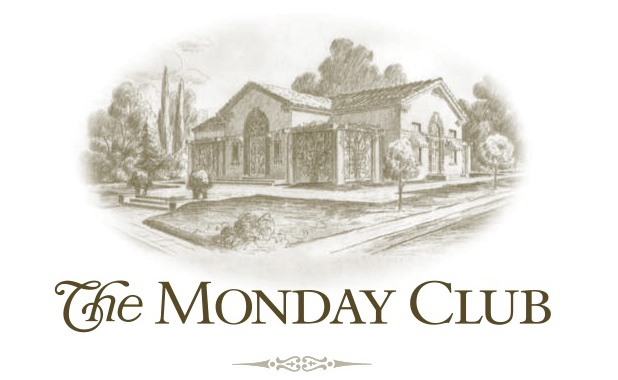 * The Monday Club - formed in 1924, Incorporated in 1930. When we are asked, “What inspires you?”, the response most often will be “Nature.” Although seeming somewhat of a cliche, for me Mother Nature is always a very honest inspiration. Looking around the Central Coast in the fall we see the many colors of harvest and the animals preparing for winter. We also find ourselves slipping into our comfortable routines of back to school, holiday baking, planning traditional gatherings with family and friends, and maybe adding an extra blanket to our beds. Nature has her routines as well. In the fall, where I live, we may catch a glimpse of geese overhead early in the morning. With the start of our new club year this month, I find myself most inspired by our membership. I am inspired when I look at our creative and hard working members as they prepare to bring a classy spirit and elegant polish to our upcoming Sip and Sample annual event. It will truly bring added sparkle to this gem of Julia's. As all the elements are coming together, I am reminded of a beautiful story shared by a friend many years ago. I would like to pass it along. When you see geese flying overhead in a “V” formation you may be interested in knowing what scientists have discovered about why they fly that way. It had been learned that as each bird flaps its wing, it creates an uplift for the bird immediately following. By flying in the “V” formation, the whole flock adds at least 71% greater flying range than if the bird flew on its own…...People who share a common direction and sense of community can get where they are going quicker and easier because they are traveling on the thrust of one another. Whenever a goose falls out of formation, it suddenly feels the drag and resistance of trying to go it alone and quickly gets back into formation to take advantage of the lifting power of the bird immediately in front….If we have as much sense as a goose, we will stay in formation with those who are headed the same way we are going. When the lead goose gets tired, he rotates back in the formation and another goose flies the point…...It pays to take turns doing hard jobs – with people or with geese flying north. The geese honk from behind to encourage those up front to keep up their speed….We need to be careful what we say when we honk from behind. Finally when a goose get sick, or injured and falls out, two geese fall out of formation and follow him down to help and protect him. They stay with him until he is either able to fly or until he is dead, and then they launch out on their own or with another formation to catch up with their group…. How quickly fall is upon us. A summer of joy, friendship, and business filled the warm days of your hard working Board of Directors. Your TMCC docents continued to take time each Monday to be at our beloved building and bring it alive for visitors and community members. The Committee Chairs also were busy planning events and programs to make your upcoming experiences at TMC valuable and enjoyable. I have been so touched and impressed by all the gracious women in our club who give so much of their time to achieve our mission and help maintain the historical building that we love and cherish. With Gratitude and Grace…...Inspire, be present, listen and contribute. These are the words I hope you will bring with you as we join together for a new year at The Monday Club. May these words echo within the walls of our Julia Morgan gem. Gratitude for those who have come before us. Grace in our manners and as we go about our custodial duties for our structure. As we move forward to protect and preserve our building, and serve our community, let us do so with inspiration. Finally, be present when you listen to those around you and as you consider how you will contribute this year. So welcome back to each of you as we approach this year with a renewed spirit of Gratitude and Grace. I look forward to your involvement with the club and will enjoy seeing each of you in September. This message has been circulated and once I read it, I thought of all of my different friends at The Monday Club. Thank you to Leslie Gottesman and Lisa Guy for sharing it with me. Now, I would like to share it with all of you. How is it possible that I can get along with them all? I think that each one helps to bring out a “different" part of me. With one of them I am polite. With another I joke - with another I can be a bit naughty! I can sit down and talk about serious matters with one. With another I laugh a lot. I listen to one friend’s problems. Then, I listen to one friend’s advice for me. My friends are like a jigsaw puzzle. When completed they form a treasure box. A treasure of friends! They are all my friends who understand me better than I understand myself. They are friends who support me through good days and bad. Real Age doctors tell us that friends are good for our health. Dr. Oz calls them Vitamin F (for Friends) and counts the belief of friends as essential to our well being. Research shows that people in strong social circles have less risk of depression and terminal strokes. If you enjoy Vitamin F constantly you can be up to 30 years younger than your real age! The warmth of friendship stops stress and even in our most intense moments, it decreases the chance of cardiac arrest, or stroke by 50%. I am so happy that I have a stock of Vitamin F! In summary, it is important to value our friends and keep in touch with them. We try to see the funny side of things and laugh together and send healing thoughts for each other in tough moments. Some of my friends are friends on-line. I know I am one of their friends because their names appear on my computer screen often. I feel blessed that they care as much for me as I do for them. Thank each one of you for being one of my Vitamins! Here’s to our good health and our friendships! Here it is. The answer to the question of what on Earth does “Auld Lang Syne” actually mean? The confusion over the song is almost as much of a tradition as the song itself. The title of the Scottish tune translates to “times gone by” and is about remembering friends from the past and not letting them be forgotten. Despite the strong association with New Year’s Eve, it was never the intent of the writer Robert Burns, in 1700, for it to be a holiday song. Guy Lombardo is responsible for bringing the song into the popular mainstream in 1929. His band used it as a bridge between two live radio programs at the Roosevelt Hotel in New York. It was just a coincidence that they played Auld Lang Syne just after the clock struck midnight and a New Year’s tradition was born! A schoolyard interpretation instructs us similarly to, “Make new friends, but keep the old. One is silver and the other is gold.” So as we approach another new year remember the wealth that we all have in each other. We continue to make new friends and new memories, but never forget the value of a dear, old friendships. Wishing you peace, joy, good fortune, and good health.